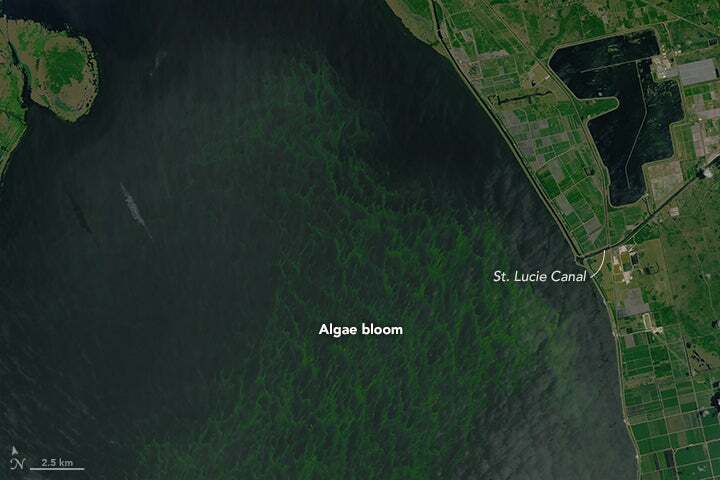 An enormous algae bloom turned Florida’s Treasure Coast a gnarly shade of green last week, and now we know just what that goopy nightmare looks like from space. On July 2nd, NASA’s Landsat 8 satellite snapped some weirdly impressionistic images of Florida’s Lake Okeechobee, in which you can see billions of green microbes spawning like mad. Fuelled by agricultural pollutants from upstream farms, the blue-green algae bloom was first noticed in Lake Okeechobee in early May. Since then, it’s grown to an estimated 239 square miles, blanketing roughly a third of the lake. Downstream coastal communities in Martin, St. Lucie, Palm Beach, and Lee Counties started seeing blooms of their own several weeks back, after the US Army Corps of Engineers began discharging lake water through special channel locks to prevent towns and sugar farms to the south from flooding. Coastal residents are aggrieved, and they have a right to be. Not only are the blooms causing surrounding areas to smell horrendous, some experts worry they could be composed of microcystis, which is toxic to animals and humans.